We now live, work, and learn in indoor environments that are often heated using condensing boiler technology. Condensing boilers have made a strong case for themselves in terms of both space and energy efficiency. Of course, the latter hinges on one critical factor: the condensing boiler must condense. And if condensation is intended as an ongoing occurrence, the correct materials and equipment must be specified to withstand the harsh effects of condensation. Stainless Steel. This is by far the most commonly selected heat exchanger material. In most cases this is 316L Stainless steel, which is more resistant to atmospheric and other types of corrosion than Types 302, 304 and 304L. Stainless Steel heat exchangers are capable of handling a wide range of pH levels and can be selected for low water volume (water-tube) boilers or high water volume (fire-tube) boilers, depending on the brand you choose. Given the high cost of stainless steel, most of these heat exchangers are of the low water volume variety, and are used in modular boiler applications. Aluminum. Aluminum heat exchangers have a lower first cost which is why you will occasionally see them used in condensing boilers. Aluminum may have a lower pressure rating so you must make sure your design is below the maximum pressure rating of the boiler. It is also important to note that aluminum heat exchangers can only handle a narrow pH range so specifiers need to take care that their application stays within that range. This means that an effective chemical treatment plan is necessary to keep the pH levels neutral. Aluminum heat exchangers are only used in low water volume applications. Cast Iron. Sometimes condensing boilers may be equipped with cast iron heat exchangers. The selection will work, depending on the application, but the cast iron must be at least ¼” thick. The surface will rust, but it will not break down, and cast iron heat exchangers will typically have a long life, regardless of water temperatures. However, it is absolutely essential to follow strict operating and blow down procedures, otherwise you will likely void the boiler manufacturer’s warranty. Click here to watch our YouTube video on Condensing Boiler Technology. 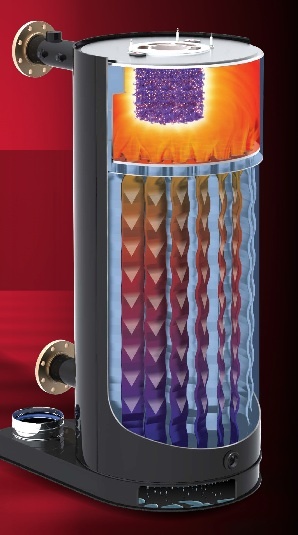 Download this document on Condensing & Non-Condensing Boilers/Water Heaters. This is a simple 2-Page "cheatsheet" that covers important topics like condensation, temperatures, venting, piping, and boiler materials.